Changing physician behaviour has become an important focus of medicine over the past two decades.1-3 The rapid expansion of medical knowledge and concerns about quality of care, have led to the birth of both the practice guideline movement4 5 and evidence based medicine.6 7More recently, medical informatics and patient participation in care have matured as distinct clinical and research entities.8-11 Great Britain has recognised the importance of improving the quality of health care with the creation of the National Institute of Clinical Excellence and the Commission for Health Improvement.2 Ultimately, each of these developments hopes to influence physician behaviour and affect how physicians make decisions on behalf of patients. Rather than a traditional review of a medical topic, we have chosen to focus on a few selected issues that are critical if we are to understand how to change physician behaviour. This paper has four parts. Firstly, we briefly review issues related to quality of care to set a context for the need to change physician decision making as a key step to improvements in quality. Secondly, we present a contemporary view of how physicians make decisions. Thirdly, we summarise what is known about changing physician behaviour. Finally, we conclude with our own views about the topic. Our focus is on ambulatory care rather than inpatient services, although many of our comments are relevant to decision making in either environment. Our understanding of the dimensions of quality of paediatric care has grown substantially in recent years.12 13 There are individual, institutional, and regional variations in diagnostic testing, hospitalisation rates, therapeutic interventions, and outcomes.3 For example, data from the United States indicate that the care of some children with asthma is not consistent with the guidelines from the National Institutes of Health. Approximately one third of children with chronic persistent asthma do not receive appropriate anti-inflammatory therapies.14 15Work on immunisation rates has consistently shown that many providers miss opportunities to vaccinate children, despite numerous recommendations and reminders from the Centers for Disease Control and American Academy of Pediatrics.16 17 Recently Van Marter and colleagues reported that depending on how premature infants are managed on mechanical ventilators, rates of chronic lung disease can vary from 4% to 22%.18 Although some variation is expected in virtually all aspects of medicine, the extent of variation reflects, in part, how physicians make decisions and provokes concern about quality of care. How do physicians make diagnostic and therapeutic decisions? A great deal has been written about the complexity of clinical decision making.19 Interestingly, a rapid review of the leading paediatric textbooks suggest that these decisions are based on mathematical models of sensitivity, specificity, positive and negative predictive values, and likelihood ratios, although there are few data supporting these models.19 Even the ongoing synopses of evaluating and reviewing the medical literature by the McMaster group in JAMA emphasise these concepts.20 Although it is critically important that physicians understand test sensitivity and specificity, we believe that medical decision making is far more complex, and can be depicted by a set of overlapping domains (fig 1).21 It is important to understand how physicians make decisions, so that we can promote the appropriate delivery of effective services. Model of clinical decision making. First and foremost, physician decisions are made in the broad context of societal norms (indicated by bracket, fig 1). As many societal norms are embedded in the consciousness of an individual, most physicians (and patients) will not normally reflect on them when making an individual decision. For example, in the United States, when a physician is faced with resuscitating an infant who weighs 580 grams at birth, the societal norm suggests that he or she do so. This decision may be quite different in other parts of the world. In Great Britain, there is little consensus that healthy children should receive the varicella vaccine. Again, the societal norm dominates the decision making process. Finally, medical resources clearly impact on societal norms. The widespread international variation in how patients with HIV disease are treated reflects, in part, profound differences in medical resources. 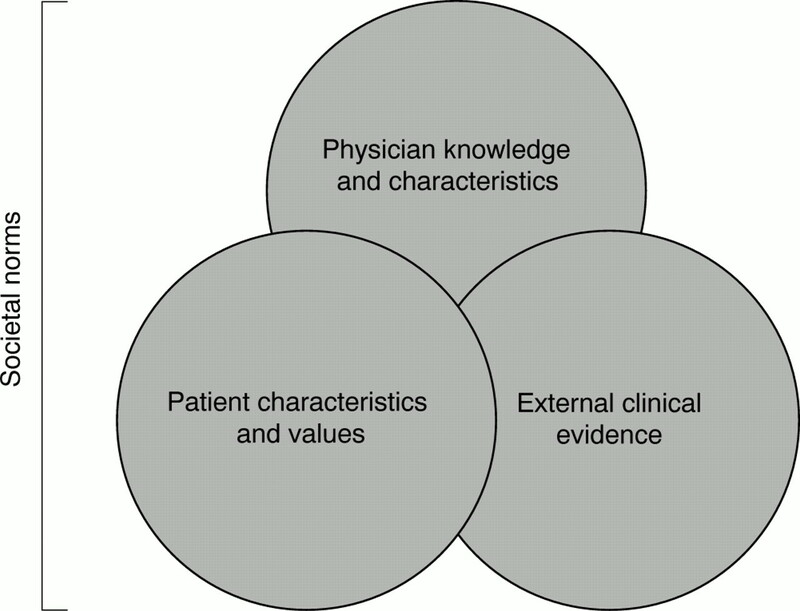 We believe that beyond societal norms, three domains influence individual medical decision making: physician experience and knowledge; patient characteristics and values; and external clinical evidence (fig1). These domains are in turn influenced by other factors. For example, culture and ethnicity may affect patient characteristics in terms of health behaviours (for example, diet) and health beliefs, values, and preferences.22 Similarly, the availability of valid and reliable practice guidelines may increase the use of external clinical evidence.23 The model also accounts for the contemporary view that patients should be partners in managing their own health care, as reflected by the inclusion of the patient domain. What is unknown about the model is how dealing with a parent, rather than the patient, influences decision making. The dynamic properties of this model are suggested in fig 2. Rather than static, the influence of a particular domain changes, depending on the type of medical decision being made. For example, when a child is seizing, few parents are active participants in the decision making process, and the patient characteristic domain is relatively small. Hopefully the physician is aware of the most current medical evidence when selecting a therapeutic agent and deciding which diagnostic evaluation to perform. This is in sharp contrast to when a physician is making a decision to dispense an antibiotic to a young child. The evidence is overwhelming that physicians are influenced by their impression of whether parents want an antibiotic.24-26 In this case, the patient characteristic domain is far more prominent. Direct advertising to patients by the pharmaceutical industry in the United States is representative of how this model explains physician behaviour.27 Advertising to patients for drug therapy for conditions as diverse as asthma, depression, gastritis, and allergies is now commonplace. Sales of these drugs have skyrocketed. In general, for acute medical problems the decision making process is largely influenced by the physician domain and hopefully the evidence domain. However, when decisions are less urgent, reflect chronic issues, or evidence is lacking, the patient characteristic domain is potentially more important. The pharmaceutical industry understands that for many physician decisions, particularly drug prescribing, patients can influence physician behaviour. There have been numerous reviews of what changes physician behaviour.28-33 Unfortunately, very few of these reviews highlight specific paediatric studies or examine whether the findings are consistent across provider types or population groups. There is good reason to hypothesise that strategies may vary in children's health care. Children receive care in diverse settings, such as schools, social service agencies, and immunisation clinics. Clinicians are dealing with parents, rather than the actual patient. Whether the same strategies will work with child health providers is often unknown. While we are learning about behaviour change, important gaps remain in the literature. Few studies consider the context of care delivery in terms of resources available to the practice or the population served. These may play a role in influencing physician behaviour, particularly in low income and racially and ethnically diverse communities, and certainly in developing countries, where resources may be far more limited. Another area where more research is needed is understanding how strategies which have been shown to be effective in single sites can be taken “to scale” and implemented on a statewide or national basis. Widespread applicability remains poorly understood and is critical; if this is not addressed, the piecemeal approach to changing behaviour will continue. Secondly, any attempt to change behaviour should involve more than one educational approach. Physicians have individual learning styles and most will not be responsive to a single approach. A multifacted approach is supported by a recent study in which investigators interviewed 100 general practitioners and consultants and asked why they change their clinical practice.39 For each change, the physicians cited an average of three reasons per change. The four most frequently mentioned reasons were: organisational factors (change has occurred because of organisational factors originating at a national level, via a health authority, within a hospital or a general hospital); education (change has occurred due to an educational activity, for example, reading medical journals); contact with professions (change has occurred due to contact with a hospital consultant); and patient centred (doctor has described either the actions of the patient or a specific consideration of the patient as a reason for change). This study also validates the model of physician decision making presented earlier, by suggesting that decision making is complex and reflects various factors. It also highlights one inconsistent finding: whereas reviews of changing physician behaviour usually do not find that passive educational efforts, such as continuing medical education or guideline dissemination, change behaviour, physicians report that information, in any form, contributes to change. Fourthly, when attempting to change behaviour, we must be aware of what specific issue is the focus of change and the evidence that supports it. Does the change involve preventive services, chronic care, or issues related to acute and urgent medical decisions? A particular strategy may be effective in only one setting for a specific type of problem. The degree to which robust evidence exists to know what behaviour will result in improved quality or outcomes is a critical underpinning of any attempt to change behaviour. In paediatrics, there is often insufficient evidence to guide many of our decisions. We rely on consensus, experience, and the expertise of others. Improving external clinical evidence may be necessary before we try to change physician behaviour for many services, lest we run the risk of promoting the delivery of care which will later be found to be ineffective, or even harmful. Often physicians have extensive discretion in their decision making, either because there is more than one proven, effective course of action available or evidence is lacking that one is superior to another. In these situations, reflecting the model of physician decision making that we articulated, it is particularly important that the physician engage the parent and child in a shared decision making model and tailor the choice to the patient and family's values and preferences. Another situation arises when patients come to the physician equipped with accurate information and can assist in driving physician decisions towards evidence based choices and away from habits that have since been proven to be ineffective or inappropriate. For example, because of wide spread dissemination of accurate information in parent magazines about resistant bacteria and the inappropriate use of oral antibiotics, more parents are now requesting that physicians do not prescribe antibiotics for respiratory illnesses. The Internet has certainly made more information available to our patients than ever imaginable. Unfortunately, the quality and accuracy of health information on the world wide web is quite variable. Nevertheless, if this new resource (with accurate information) can be used to influence patients, then for some issues, the Internet, through patients, may be an effective way to change physician behaviour. Fifthly, we must better understand the promise of medical informatics. Certainly in the hospital setting, particularly in the United States where the presence of computers is increasingly common, informatics is being used to change behaviour. Computers have been shown to change physician prescribing, increase their delivery of preventive services, and reduce medical errors such as adverse drug events.8They do so by providing in “real time” information about patients' laboratory and other results, prompting about recent evidence that might alter the type or duration of a prescribed medicine or plan of care, and building safeguards into test ordering and drug prescribing. Unfortunately, electronic medical records are not yet widely available in the ambulatory setting, and may ultimately only be available in limited clinical settings. Finally, professional societies and other providers of continuing medical education should update their approaches. Although we believe that providing information to physicians is important as a prerequisite to change, the evidence of what changes physician behaviour should be incorporated into mandated continuing medical education; otherwise, societies are missing the opportunity to dramatically improve the quality and effectiveness of their educational responsibilities. We believe that trying to change physician behaviour in order to improve quality of care is a critically important endeavour for medicine—it reflects current emphasis on cost, evidence, and patient participation in their care. For many physicians, trying to practice up to date medicine is an important part of their professional life. Unfortunately, there is limited time for reading, meeting with colleagues, or reviewing their own practice. We must continue to emphasise creative, efficient, and innovative approaches that help physicians change their behaviour and improve the quality of health care. (1993) Changing physician behavior. N Engl J Med 329:1271–1274. (1998) Quality to the fore in health policy—at last. BMJ 317:95–96. (1999) Evidence-based medicine: a new science or epidemiologic fad. Pediatrics 103:1029–1031. (1997) Practice guidelines and practicing medicine. Are they compatible. JAMA 277:1977–1978. (1997) The status of pediatric practice guidelines. Pediatrics 99:876–881. (1996) Evidence based medicine: what it is and what it isn't. BMJ 312:71–72. (1998) Clinical decision support systems to improve clinical practice and quality of care. JAMA 280:1360–1361. (1989) Informed decision making in outpatient practice—time to get back to basics. JAMA 282:2313–2320. (1994) Incorporating patients' preferences into medical decisions. N Engl J Med 330:1895–1896. 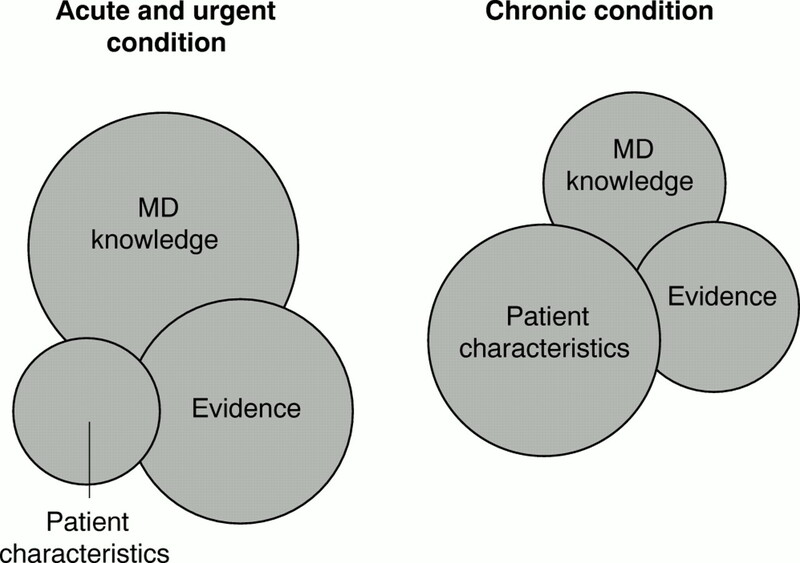 (2000) Patients as partners in managing chronic disease. BMJ 320:526–527. (1995) The pediatric report card for preventive services. Pediatrics 95:930–934. (1998) Overview of issues in improving quality of care for children. Health Serv Res 33(part 2):977–1000. (2000) Inadequate therapy for asthma among children in the United States. Pediatrics 105 (suppl) 272–276. (1994) Immunization practices of pediatricians and family practitioners in the United States. Pediatrics 94:517–523. (19992) Immunization opportunities missed among urban poor children. Pediatrics 89:1019–1026. (2000) Do clinical markers of barotrauma and oxygen toxicity explain interhospital variation in rates of chronic lung disease. Pediatrics 105:1194–1201. (1991) Uncertain decision making in primary care. in Primary care research: theory and methods. AHCPR Publication No. 91-0011. ed Grady ML (US Department of Health and Human Services, Washington, DC), pp 153–158. (1993) Users' guides to the medical literature. I. How to get started. JAMA 270:2093–2097. (2000) Antibiotics without prescription: “bacterial or medical resistance”? Lancet 355:1480. (2000) Race/ethnicity, gender, socioeconomic status—research exploring their effects on child health: a subject review. Pediatrics 105:1349–1351. (2000) Lessons from experienced guideline implementers: attend to many factors and use multiple strategies. Journal of Quality Improvement 26:171–188. (1998) Reducing inappropriate antibiotic oral antibiotic use: a prescription for change. Pediatrics 102:142–145. (1999) The relationship between perceived parental expectations and pediatrician antimicrobial prescribing behavior. Pediatrics 103:711–718. (1999) Parents, physicians, and antibiotic use. Pediatrics 103:395–401. Raymond J, Gesalman AB. Prescription drugs: why they cost so much. Newsweek 25 September 2000:22–30..
(1998) Closing the gap between research and practice: an overview of systematic reviews of interventions to promote the implementation of research findings. BMJ 317:465–468. (1999) Getting the evidence into practice. Eff Health Care 5:1–16. (1999) Impact of formal continuing medical education. Do conferences, workshops, rounds, and other traditional continuing education activities change physician behavior or health care outcomes. JAMA 282:867–874. (1998) Outreach visits to improve health professional practice and health care outcomes. The Cochrane Library, Issue 1. (Update Software, Oxford). (1995) No magic bullets: a systematic review of 102 trials of interventions to help health care professionals deliver services more effectively or efficiently. Can Med Assoc J 153:1423–1431. Obrien T, Oxman AD, David DA, et al. Audit and feedback versus alternative strategies: effects on professional practice and health care outcomes.Cochrane Database of Systematic Reviews, Issue 1, 2000..
(2001) A report care on quality improvement for children's health care. Pediatrics 107:143–155. (2000) Effects of financial incentives on medical practice: results from a systematic review of the literature and methodologic issues. Int J Qual Health Care 12:133–142. (1999) The use of physician financial incentives and feedback to improve pediatric preventive care in Medicaid managed care. Pediatrics 104:931–935. (1998) Assessing the quality of healthcare provided to children. Health Serv Res 33:1059–1090. (1997) Why general practitioners and consultants change their clinical practice: a critical incident study. BMJ 314:870–879. (1999) Why don't physicians follow clinical practice guidelines? A framework for improvement. JAMA 282:1458–1465. (1996) The awareness-to-adherence model of the steps to clinical guideline compliance. Med Care 34:873–889. The views expressed in this article are those of the authors and do not necessarily represent those of the Agency for Healthcare Research and Quality.